Let’s be perfectly clear on this. Gold-plating anything, be it a phone, or a toilet, or a smartwatch, is a terrible and tacky idea. But gold-plating a drone is even worse, and it has nothing to do with aesthetics. Gold is heavy, so why would you slather it all over a gadget that needs to be as light as possible for best performance? Drones already have terrible battery life since they have to power four electric motor-driven propellers that are trying to lift the drone itself, its aforementioned batteries, and a camera, as is the case with this DJI Phantom 4. Adding a layer of 24-karat gold only serves to make this quadcopter heavier, and more of a shiny target for people who like to knock drones out of the sky. And then there’s the price. A regular DJI Phantom 4 will cost you around $1,200, but these gold upgrades push the price tag to well over $24,000. So you’ll be paying more for a drone you will inevitably crash, than a new car. 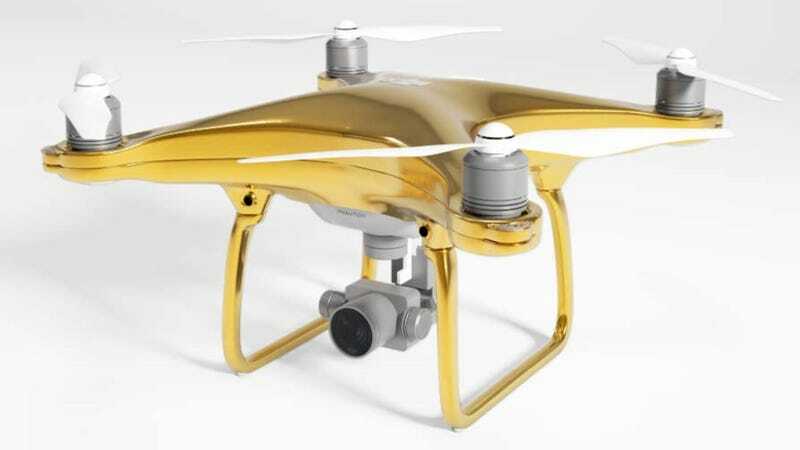 Share the post "Gold-Plating a Drone Is Officially the Worst Idea"